I'll admit it, I kind of hate Rubik's Cubes. I'm nowhere near smart enough or patient enough to be able to solve them on my own, and usually give up after 30 seconds of twisting the thing around. But! They are cool looking, and an icon of the 80's. So when I saw that Salon Perfect had come out with a glitter topper inspired by the infamous Cube, I had to do some nail art to match. The first polish I grabbed for this nail art was Salon Perfect Ruby's Cubes from the new Top of the Class collection (available at Wal-Mart). It was the inspiration, after all! I layered one coat of it over black on my pinky, pointer, and thumb. 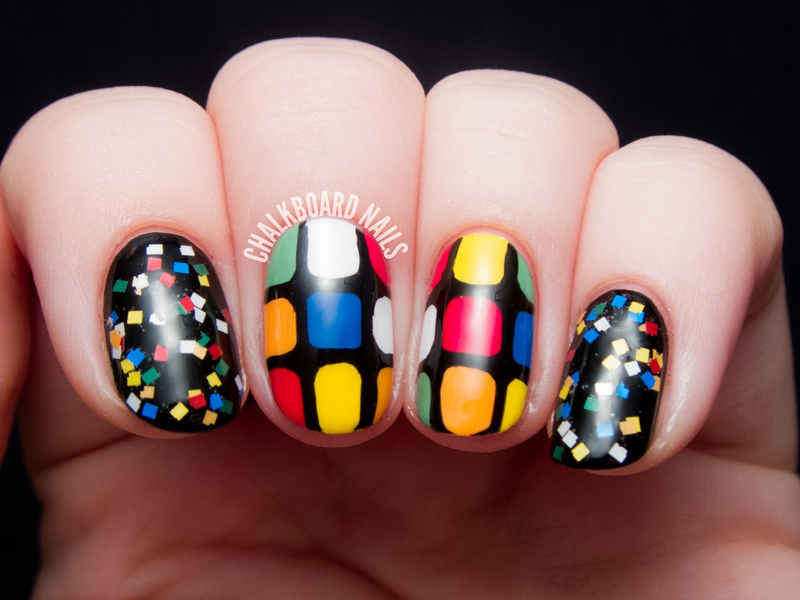 I think Rubik's Cube nail art is the only way I can enjoy this classic 80's toy. What about you? Did you ever solve one? I love Rubik's cubes as a matter of fact I you to collect all kinds of versions when I was a kid and put them up on my shelf after i solved them. You know you can get really cool ones that are shaped like robots etc especially in Japan. Lol what a weirdo right? In any case I really think this mani is adorable and super nostalgic for me. Love this! I never had the patience to solve more than one side and I never even thought to peel off the stickers. Oh, I'm totally the one who tries to cheat at remove the stickers! Too bad they never quite stick the same way again. This glitter is awesome! These nails are fantastic!! I used to just give up on trying to solve them when I was younger, but now there is an iPhone app that will solve it for you. It gives you step by step instructions and everything haha! oh i love that glitter! nothing short of amazing. One of my favorite manis ever! This manicure is so awesome! 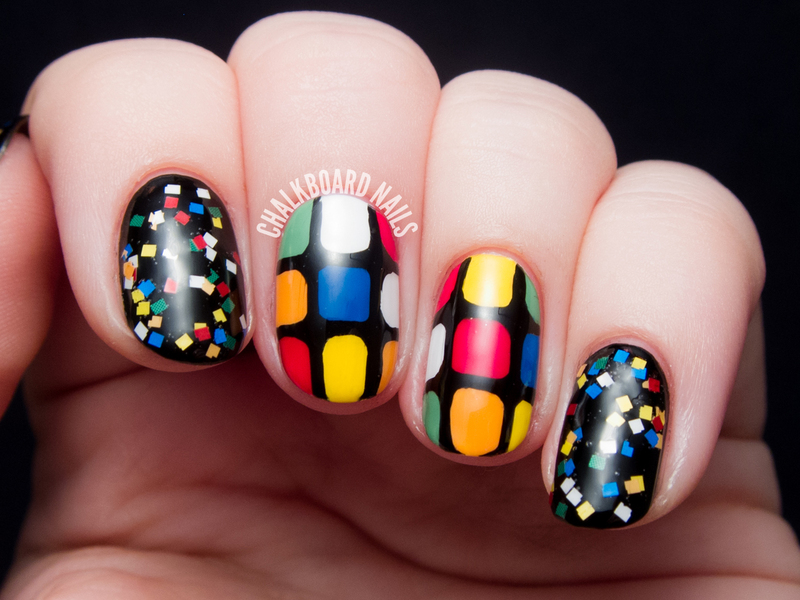 I'm with you, I always hated trying to do a Rubik's Cube, but this mani is fab. 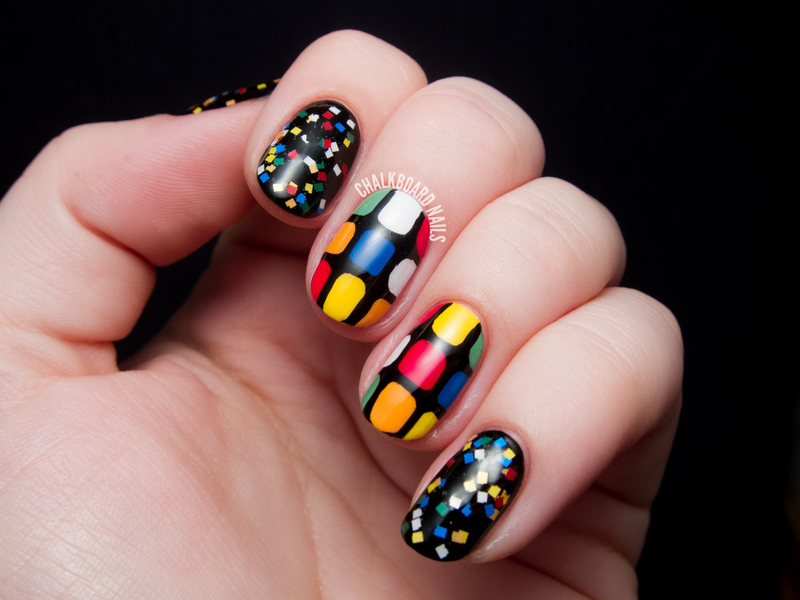 Never solved it, but I do looooove this nail art :D! Just in case anyone else here is in the East Valley of the Phoenix Metro, the Wal-Mart on Pima in Scottsdale has a good selection of the new Salon Perfect polishes and top coats. I only mention it because so many of the Wal-Marts around here seem to have cosmetic sections that have been just RAIDED. I got Ruby's Cube and Spot On. Haha Rubik's cubes bore me after a while so I never was really into doing them. But the glitter nail art around it looks awesome and I love the nail art you did to go with it. Great pattern, and one of the most creative I've seen in a while.